Most reports give you the option to change the header (info at the top of each page), font (size and type of font), and style (grid lines). (Roster Name) - Displays the name of the active roster. 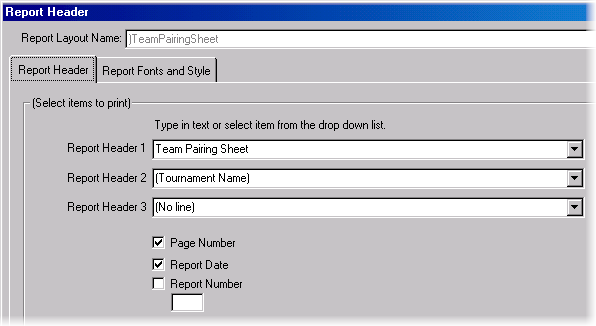 (Tournament Name) - Displays the name of the tournament you are currently working with. (Course Name Played) - Displays the name of the course being played. (Current Round - <ROUND#> on <ROUNDDATE>) - Displays the current round’s number and date. For example if you are viewing round #3 on 6-7-06, the header would print “Round #3 on 06/07/06”. You can set font sizes and styles for the Report Header, Column Headers and Report Body. Just click the box to change the font style. If you wish to display heavy horizontal or vertical lines to separate rows or columns, check the Display Horizontal or Display Vertical Grid Lines check box. You can also display a lighter line between rows by checking the Horizontal separator line between each row. Then select the shade of the line...light gray, gray, or black. Tip: Placing light lines between rows on wide reports make them easier to read. 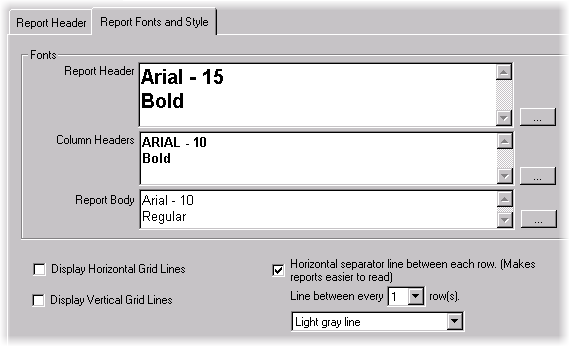 Check the horizontal and vertical grid lines options to make web reports easier to read.